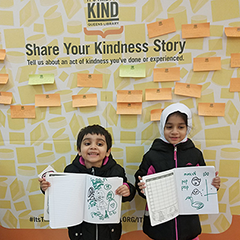 Queens Library celebrated the kindness that fills our communities with our It’s Time for Kind campaign during this past holiday season. “Kindness can change the world,” President and CEO Dennis M. Walcott said at a kickoff event for our campaign. Learn all about the programs and events we held across our 62 libraries, including our canned food drive, our Kindness Read-Alouds, and much more! Thank you to everyone who participated for helping to create a more kind community.